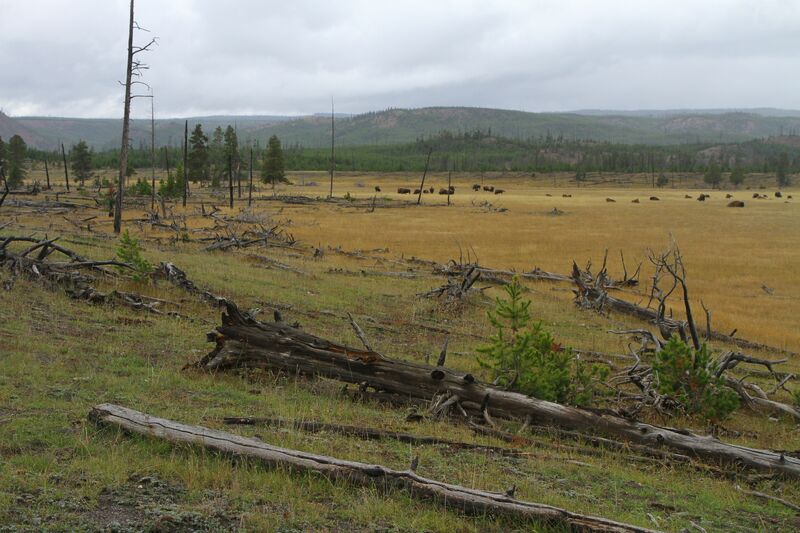 Yellowstone Park: with more bison older forests? Between 25 September and 4 October 2014, Frans Schepers and Wouter Helmer visited Wyoming and Montana in the United States, where they were invited to speak about Rewilding Europe at the 2014 Annual Gathering of the American Prairie Reserve. Apart from the American Prairie Reserve, they also visited Yellowstone and Grand Teton National Park. This is a first out of a series of blogs, presenting some of the impressions of their visit. 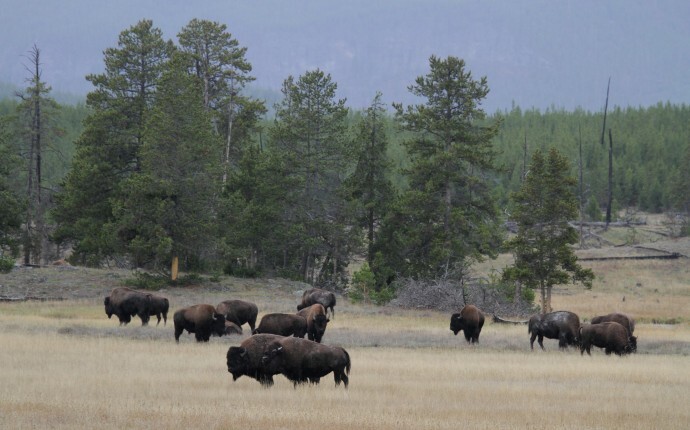 Yellowstone National Park holds some 5,000 free-roaming American bison. A lot of them leave the park in winter and graze in the surrounding areas, creating challenges for bison conservation. In the early beginnings of Rewilding Europe, we announced the ambition that we wanted to develop our own ‘European Serengeti’s and Yellowstone’s’. But this was without ever having put a foot on the ground there, so this was only based on some movies on TV and pictures on the Internet. But during this autumn, this situation came to an end thanks to an invitation from the American Prairie Reserve to present our European story at their Annual Gathering in Bozeman. And then suddenly Yellowstone is right around the corner. What a spectacular place! The deeply carved canyons of the Yellowstone River itself, with volcanic rocks in all colours of the rainbow. Thousands of bubbling and sputtering geysers, their plumes now mingled with the low-hanging autumn mists shrouding the landscape in sulphur fumes. And wildlife everywhere! 150 years of conservation and a long tradition of no hunting have made the animals loose their shyness and become a main attraction of the park. Indeed a great example for Europe. Every year millions of people come to Yellowstone to enjoy the large herds of bison, migrating across the hills, the rutting of elks, pronghorn antelopes chasing each other or mice-hunting coyotes. You could not avoid wildlife if you tried. From time to time a group of bison or mule deer crossed the road, just in front of our car. Driving through the Lamar valley, in the Northeast part of the park we even saw a young grizzly bear running full speed across the road in front of us, crossing the Lamar river and trotting through the fields behind. Jumping out of the car, to get a better view on the animal, we found ourselves standing at a small elevation, which later turned out to be an inhabited burrow of badgers. While the grizzly was shaking the water from his coat, we saw a group of 80 bison in the background grazing at the edge of the forest. Between the bear and bison a herd of pronghorns passed by. At the same time a pack of coyotes was howling in the distance and just ahead of us six mergansers were snorkeling in the Lamar River. River otter pair in the Lamar River, Yellowstone National Park. We spent only two days in the park, but are still processing our impressions: belted kingfishers diving from high firs into the water of the crystal clear rivers. Young wolves feasting on the carcass of an elk their pack had taken down the night before. With bald eagles and ravens around, waiting for their chance to pick up some of the remains. The enormous density of red squirrels and least chipmunks chasing each other on the forest floor between the sage bushes. The loons on the lakes, a flock of hunting mountain bluebirds whirling around an old solitary bison bull, and in the same field a couple of sandhill cranes stepping through the high grass. We felt like two young boys in an oversized candy shop. Two days are too short to get a good impression of such a large park. And yet it was immediately clear that something strange is going on here. Almost nowhere in Yellowstone will you find old forests. In fact, most of the forests we saw were almost monocultures of young pines. Very species-poor, densely packed pine forests, obviously the result of forest fires. The largest fire took place in 1988, but since then forest fires are still a significant factor in the ecosystem of Yellowstone. Of all the plants, there is one species that benefits extremely well from the fires by massive spontaneous regeneration: the lodgepole pine. The uniform young pine forests stands, which result from this, are again highly vulnerable to large-scale fires, bringing the landscape in a vicious circle to a further increasing dominance of lodgepole pines. Nothing wrong with that if you like lodgepole pines, but otherwise there remains not much to be experienced. How many natural processes can be seen here: impact of natural fire, dead wood in the ecosystem, spontaneous forest regeneration, natural grazing keeping land open, and natural fire prevention by bison? Unless a herd of bison seizes such a burnt plain. Through their grazing and nibbling, bison suppress the pine seedlings and promote grasses and other herbaceous plants. They take sand baths, deposit their manure and create an infrastructure of bison tracks. 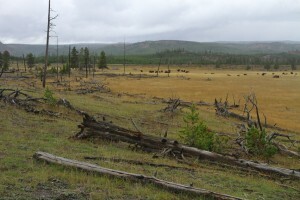 In these bison areas pines are only found in groups, for example in the shelter of stumps and trunks of burned trees. We saw such a landscape emerging along the Firehole River, but also in other parts of the park, dominated by bison. The result is a very diverse landscape, where grasslands and groves alternate. A landscape that therefore is much less susceptible to large-scale fires, because the grasslands act as natural firebreaks. Because of this, the forests in this mosaic landscape could become much older than the fire-prone monocultures of the ungrazed landscape. So it seems no bold statement if we say that with more bison, the forests in Yellowstone could become older. And of course more varied, richer in species and more attractive for the visitors. But the plans are in the opposite direction: the park authority is being placed under pressure to lower the numbers of bison; to bring the current number of 4,900 animals back to about 3,200. 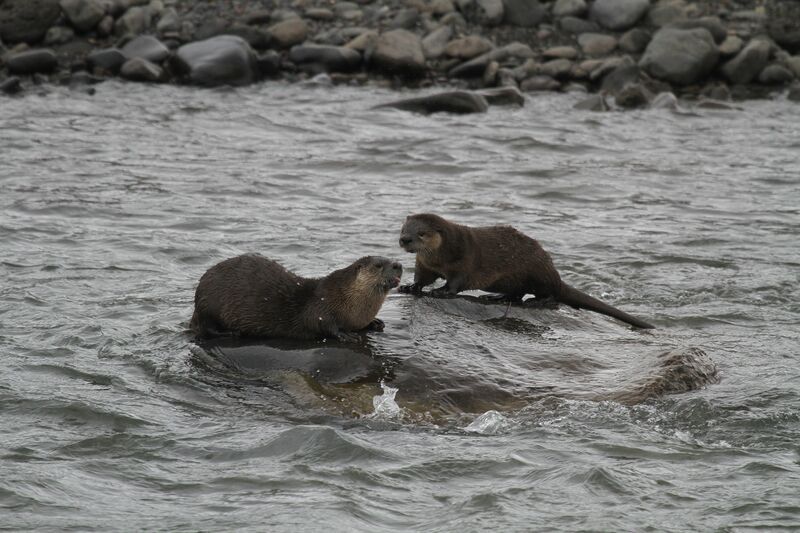 The reason is that in winter, a large portion of the animals migrate from the high altitudes in Yellowstone (average height > 2,000 meters) to the surrounding lower areas and cause local grazing competition in these places. We have seen the data of that impact outside the park, but can only hope that when the final assessment is done, the park managers will also include the avoided damage in the park itself when the bison numbers stay on a higher level: the reduced risk of large-scale fires, the value of an attractive landscape, with older forests and with more wildlife. And of course with more paying tourists to enjoy it. We would love to be one of them again!